The summer blockbuster season is upon us. Track all the giant lizards and heroes before they hit the silver screen with the new MovieLaLa app for iPad. 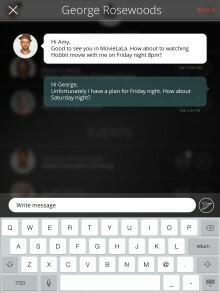 The app features a personalized feed of your favorite Hollywood actors, movies and directors. Once you’ve personalized the app with your favorite stars and films, notifications will keep you abreast of the latest trailers, news and release schedules. Plus, you can dive deep into each movie with cast lineups and video interviews. Add your friends to your feed for potential movie interest matches. If there is a match, the in-app messaging service and local showtimes can help you schedule a time and place to see a movie. Friends can be invited to screenings via MovieLaLa accounts, Facebook or through your contacts list. If your friends are RomCom fans and you’d rather see all the explosions, the app will also help you find like-minded movie goers. You can go to the movies with a complete stranger who also enjoys the exploits of mutant heroes. Maybe you’ll find a new BFF. More likely you’ll chat while waiting in line then ditch each other once the film ends. Either way, you weren’t technically alone when you saw the new Transformers movie. While MoveLaLa is currently iPad only, there are iPhone and Android versions slated to be launched in the coming weeks for on-the-go movie tracking and scheduling with friends or potential new friends.